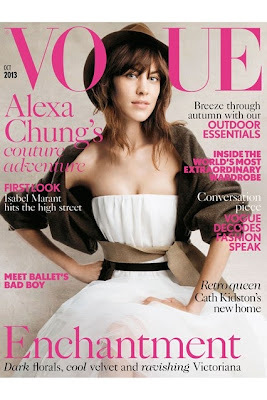 For the third time ALEXA CHUNG takes over Vogue's cover, in October issue she was photographed by Patrick Demarchelier. On Monday, September 11, Chung will take on a new role - as guest editor of Vogue.co.uk. She will be contributing to every area of Vogue's site, as she tells Vogue all about her debut book, It; names her must-have pieces for autumn/winter 2013; and reveals her definitive playlist - and that's just to start.